Later days i am working on 2D games for Multi-Platform Devices (iPad ,Android and Web) using starling framework. Really nice exp on working with starling frame work , So i would like to share small introduction about Starling. Starling is an Action Script 3 2D framework developed on top of the Stage3D APIs, available for the desktop in Adobe Flash Player 11. Starling was designed for game development, but you can use it for many other applications. Starling makes it possible to write fast GPU accelerated applications without having to touch the low-level Stage3D APIs. Starling is designed for ActionScript 3 developers, especially those involved in 2D game development. Starling runs in the browser and on all major mobile platforms, like iOS and Android. Starling is a pure ActionScript 3 library for Adobe Flash. Starling is lightweight, flexible and easy to use. Platform independent & Amazing Performance,familiar API. You can download the framework and tutorials from following sites. H A P P Y N E W Y E A R 2013 !!! 600 people reached the top of Mt. Everest in 2012. This blog got about 7,300 views in 2012. If every person who reached the top of Mt. Everest viewed this blog, it would have taken 12 years to get that many views. I given below the one of the simple matching game in AS3. This is very simple flash physics in AS3. This script creates a box and makes it bounce around in a container, changing direction when a wall is hit and change profile pictures while box moving. Simple Animation – Simple Physics Files. 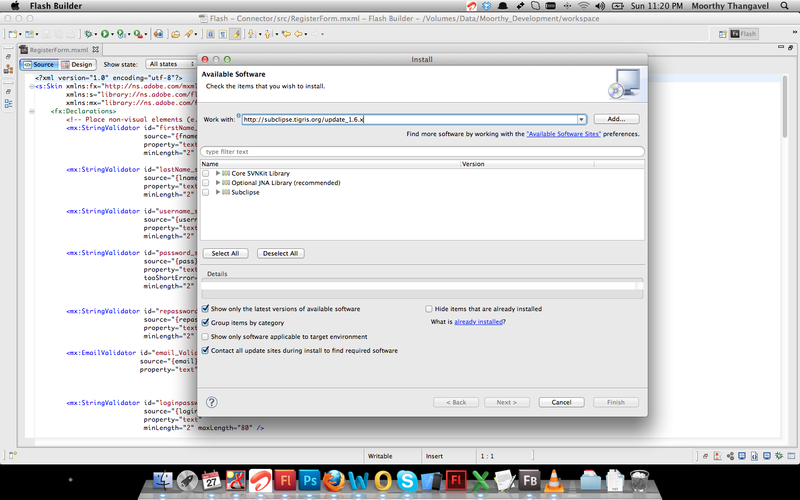 How to Install Subclipse SVN in Flash Builder 4.6 ? Recently i am installed the SVN plugin in Flash Builder 4.6, The Subclipse SVN is one of the most frequently used plug-ins with Flash Builder. I am used the following simple instructions for installing Subclipse SVN and importing an existing project. Step 1 : Open the Flash Builder 4.6. Step 3 : Click the “Add” button. Location : http://subclipse.tigris.org/update_1.6.x then click “Ok” button. Once complete the wizard . Restart the Flash Builder. Step 5 : Manually we need to select SVNKit for your SVN interface in Flash builder , So Click Flash Builder menu and choose Preferences . 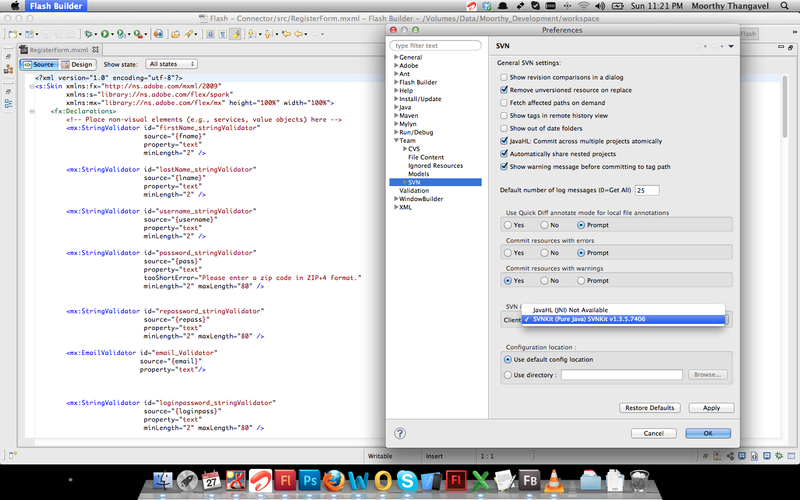 Step 7 : Then click “Ok” now sucessfully installed the SVN plugin in Flash Builder 4.6. Now we can import the projects from SVN repository. 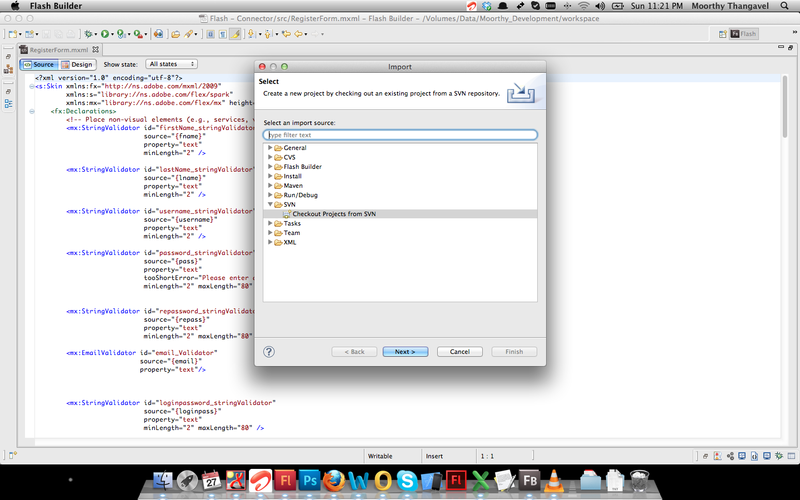 Step 9 : Click Next then Create or Select a repository location. Step 10 : Select your project root folder. The AS3 LocalConnection is the same as in AS2, only differences is the event listeners. The AS3 LocalConnection class to send and receive data between two different SWF files. Here i am using two swf files one of them is the sender swf file.This file contain the method to be invoked and a call to the send() method. The other one is the receiver swf file .This file contain the invokes the method and a call to the connect() method. Both swf files must have a LocalConnection object with the same names. Type some text in sender swf file, while typing the text values are passing to receiver swf file.